The line-up of microscopes consists of a complete range of stereo microscopes including models with a connection for a USB camera, and many accessories such as auxiliary lenses, eye pieces, XY tables and lighting solutions. 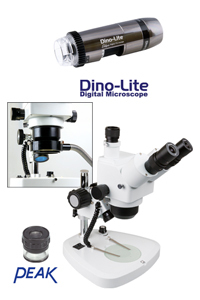 We also sell the vast range of Dino-Lite digital microscopes and accessories. Ask our sales department for more detailed information about our microscopes.